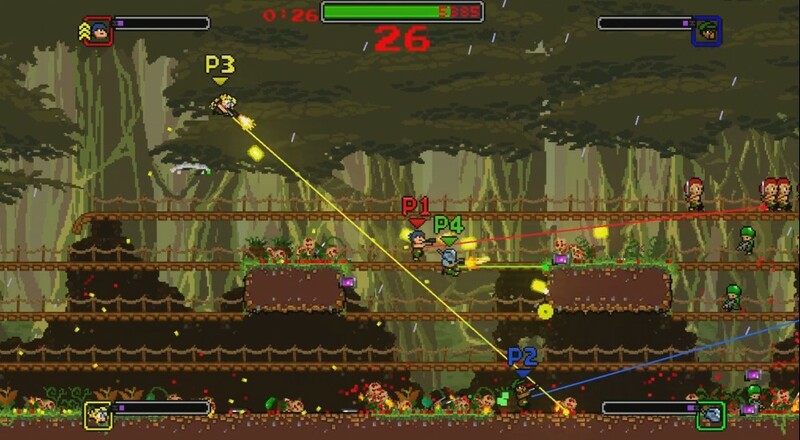 Co-Optimus - Video - Gunnihilation Is Part Contra, Part Broforce - All Bullet Hell. Gunnihilation Is Part Contra, Part Broforce - All Bullet Hell. If you're looking to get a classic gaming fix on, but with a modern day edge, the upcoming game Gunnihilation by Robopixel Games should fill the void. Heavily inspired by classic arcade games like Contra and Smash T.V., you're dropped into a 16-bit world filled with enemy soldiers, mechs, and other baddies as you jump, shoot, and dodge your way through the gunfire. The game hit Steam's Greenlight service last week and in four short days was greenlit. The team even took the game to EGX, and won 'UK Game of the Show' at Gamescom 2015 while also being featured by the BBC and Develop magazine. Needless to say this little Unity developed shooter has gotten a lot of attention. As for co-op, right now the game features four player couch co-op action. Though the team is looking at bringing the game to consoles and with that comes the possibility of online co-op. There's an Alpha version available for anyone to download right now, so you can get a feel for the game. I checked it out this morning and it's a solid and fun little romp so far. It's definitely got that Contra feel to it, with maybe a splash of Metal Slug. I especially like how the body count piles up in the background as you annihilate the pixelated enemy soldiers with numerous weapons like a shotgun, pistol, machine gun and a giant hammer. Yes, a giant hammer. Gunnihilation will be out on Steam Early Access this summer with a planned release in early 2017. Page created in 0.7644 seconds.